Books on regression and the analysis of variance abound-many are introductory, many are theoretical. While most of them do serve a purpose, the fact remains that data analysis cannot be properly learned without actually doing it, and this means using a statistical software package. There are many of these to choose from as well, all with their particular strengths and weaknesses. Lately, however, one such package has begun to rise above the others thanks to its free availability, its versatility as a programming language, and its interactivity. 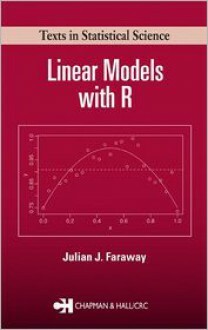 That software is R.In the first book that directly uses R to teach data analysis, Linear Models with R focuses on the practice of regression and analysis of variance. It clearly demonstrates the different methods available and more importantly, in which situations each one applies. It covers all of the standard topics, from the basics of estimation to missing data, factorial designs, and block designs, but it also includes discussion on topics, such as model uncertainty, rarely addressed in books of this type. The presentation incorporates an abundance of examples that clarify both the use of each technique and the conclusions one can draw from the results. All of the data sets used in the book are available for download from http://www.stat.lsa.umich.edu/~faraway/LMR/.The author assumes that readers know the essentials of statistical inference and have a basic knowledge of data analysis, linear algebra, and calculus. The treatment reflects his view of statistical theory and his belief that qualitative statistical concepts, while somewhat more difficult to learn, are just as important because they enable us to practice statistics rather than just talk about it.